Charlotte’s dream is to be a satisfactory young lady, to please her parents and to be a credit to them. When she boards the Seahawk bound for America to join her family in Providence Rhode Island, she has no idea that this dream is to be put to the most severe test possible. The journey rapidly turns into a nightmare when Charlotte discovers that the families who were supposed to accompany and chaperone her are not traveling with her after all. It is the 1830’s and it is quite unheard of for a young lady to travel on a ship full of uncouth men by herself. And yet travel with them she must. Charlotte is much relieved to find that the captain is a “gentleman” just like her much revered father and she turns to him for comfort, advice, and support. In turn the captain asks Charlotte to tell him what is going on with the crew. She is to let him know if they show signs of discontent or mutiny. When Charlotte fulfills her promise and informs on the unhappy and angry crew she discovers that she has made a dreadful mistake. The crew members are in fact the victims in the unhappy story of the Seahawk, and the captain is the brutal, murderous despot who rules over them. 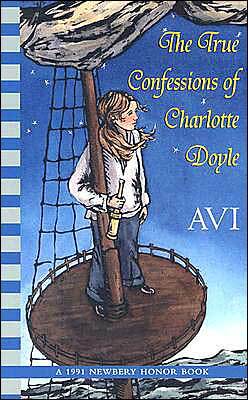 Faced with her terrible act of betrayal, Charlotte makes a desperate, courageous, and quite unheard of decision. Is her choice going to bring about her own untimely end? With the skill of a master storyteller Avi tells a tale which is threaded with adventure, betrayal, honor, fear, and unexpected incidents. Charlotte grows from a somewhat shallow, small-minded little girl into a young woman who faces her own fears and who does her best to make amends for her mistakes. She is a character one can grow to love and fear for, and this is a book to share with others and to treasure.